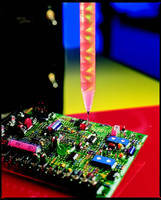 PassingÂ Navy Hex Bar Test, MIL-I-16923C, which consists of 10 cycles from -55 to +155Â°C, two-part epoxy resin 20-3301 protects electronic assemblies from thermal cycling and shock. Low viscosity epoxy flows quickly around components, giving users working time of 4–6 hr. Product is typically cured at 80Â°C for 1–2 hr, but post cure of 150Â°C for 3 hr will optimize performance properties. Applications include electronic potting and encapsulating, casting, coating, and electrical varnishes. Easy to use, two part epoxy resin 20-3301 provides electronic assemblies protection from severe thermal cycling and shock. It passes the difficult Navy Hex Bar Test, MIL-I-16923C, which consists of 10 cycles from -55 to +155°C. This toughened epoxy is low in viscosity and therefore flows quickly around components while giving users a long working time of 4-6 hours. This product is superior to most room temperature curing epoxies in terms of chemical resistance, wide service temperature range, electrical insulation, and overall physical properties. 20-3301 is typically cured at 80°C for 1-2 hours; however a post cure of 150°C for 3 hours will enhance performance properties. 20-3301 applications include electronic potting and encapsulating, casting, coating, and electrical varnishes. This epoxy system is a good choice for high temperature applications that require a material that is not rigid or brittle. More information about the 20-3301 Epoxy Potting Compound is available at http://www.epoxies.com/_resources/common/userfiles/file/20-3301R.pdf. Technical Support can be reached by phone 401-946-5564 or sales@epoxies.com. Samples are readily available. Encapsulation Tool deposits multi-layer ultra barrier.